PART TWO OF TWO-WEEK TRIBUTE TO THE THREE PEPPERS! "Love Grows On The White Oak Tree"
Above: Ad for The Three Peppers. 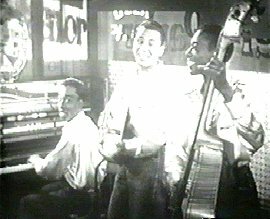 (L-R) Walter Williams (bass), Bob Bell (guitar), and Roy Branker (piano). 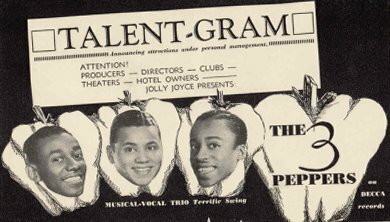 The ad proclaims "Announcing attractions under personal management", "MUSICAL-VOCAL TRIO Terrific Swing", and "on DECCA Records". Above: Australian Decca #Y5442 (released in USA on Decca 2557). 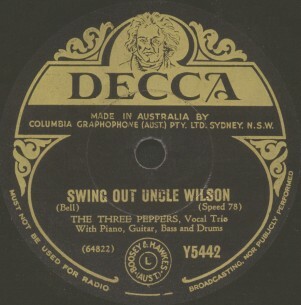 It was their second of seven on Decca. 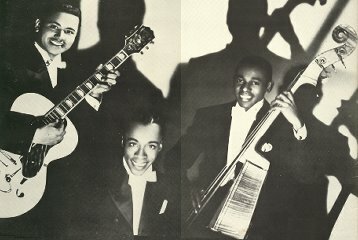 They later recorded for the Gotham label resulting in one known release in 1949. FOR PART ONE OF THIS TRIBUTE, PLEASE CLICK HERE. Above: Photo of The Three Peppers. (L-R) Bob Bell, Roy Branker, and Walter Williams. Above: Still shot from the 1943 movie "A Lady Takes A Chance". (L-R) Roy Branker, Bob Bell, and Walter Williams. To view a short video (39 seconds) from the movie, please click HERE.